The Eastern Michigan Eagles knew they had to get off to a fast start if they wanted to get back on track in conference play, and after 11 minutes of action, the Eagles effectively buried the Bobcats. 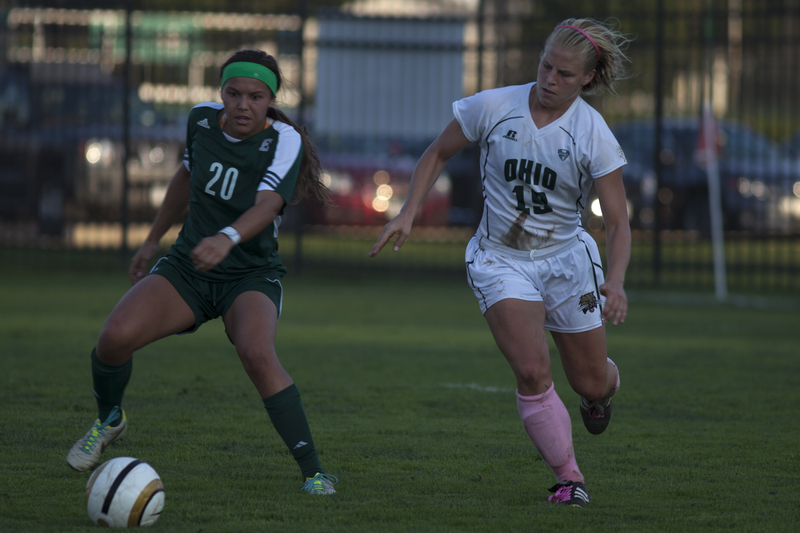 3-0 victory over the Ohio Bobcats at Chessa Field on Friday evening. Ohio (6-5-4, 2-3-2 MAC) came into the game with a tactical change. The ‘Cats started the contest in a 4-2-3-1 shape, with freshman Alexis Milesky playing behind sophomore striker Holly Harris. Junior Annie Beard and sophomore Leah Sandercock were the holding midfielders, and freshman Mollie Whitacre and junior Tonya Frasik played outside back. Sophomore goalkeeper Megan McCabe had seven saves for the Eagles (8-6-1, 5-2-0 MAC). On the other side, Ohio goalkeeper Mattie Liston made an incredible 15 saves in the match. Rodgers was pleased with Liston’s performance. In the early stages of the match, both teams were able to pass the ball around without too much trouble, but it was the visitors who made the most impact. On five minutes, Vultaggio found striker Bianca Rossi, and the junior’s shot was saved by Liston. Four minutes later, the Eagles got on the scoreboard. Vultaggio found Stephanie Clarke, and Clarke made a cross-field pass to Cutaia, who took her time to unleash an unstoppable drive past Liston to give the Eagles the momentum. Just two minutes later, the Eagles doubled their lead. Vultaggio was one-on-one with Liston, and the goalkeeper was able to keep the junior’s initial effort out of the net, but Vultaggio got her own rebound, took her time and coolly slotted the ball past Liston for a 2-0 lead. Maggie Murnane and Alli Cislo were brought on as substitutes, and on 24 minutes, the Green and White let an opportunity go to waste. Cislo stole the ball in midfield and found Harris on the right wing, who crossed the ball into the box for Milesky, and the freshman’s header was saved by McCabe. With nine minutes remaining until halftime, the Eagles almost added a third goal. Cutaia found Rossi, and the forward’s shot went left of Liston’s post. After 45 minutes of play, Easter Michigan held a 10-2 shots advantage and a narrow 2-1 advantage in corner kicks. With 10 minutes gone in the second half, the Bobcats created a scoring opportunity. Liz Finley received the ball on the left side of the 18-yard box, and her shot went wide right of the goal. Seven minutes later, Ohio was at it again. Finley was charging toward the Eagles goal, and she passed the ball out wide to Carly Manso, who failed to put in a decent cross to her teammates. On 63 minutes, Liston made three crucial saves. Cutaia’s header was saved by the senior, and Rossi saw not one, but two shots saved by Liston to keep the score at 2-0. At the 70-minute interval, Murnane made her presence felt. After her cross inside the box did not find a teammate, the central midfielder tried her luck at goal, and her shot hit the crossbar and stayed out of the net. With 11 minutes remaining, the Eagles put the result beyond doubt. Vultaggio found Cutaia in the box, and the midfielder calmly placed the ball past Liston to make sure the victory was Eastern Michigan’s. 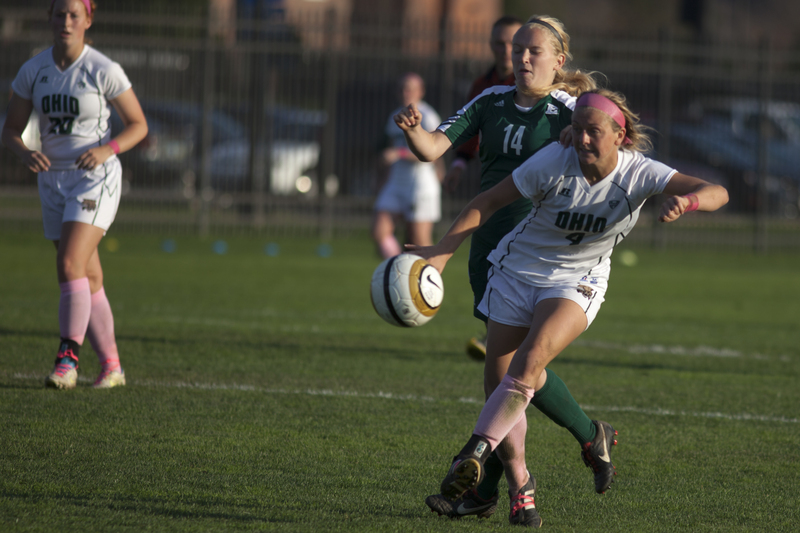 The Ohio Bobcats will look to rebound Sunday when they host Mid-American Conference West foe Western Michigan. Kickoff is scheduled for 1 p.m.